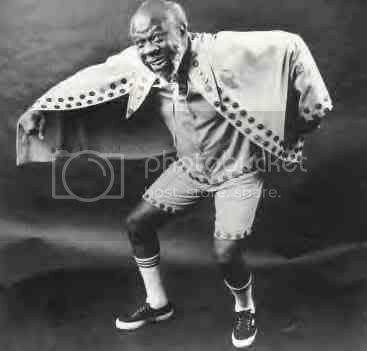 Few soul artists could jump start a party better than Stax Records' Rufus Thomas. Even at 51, the "World's Oldest Teenager," as he was known to audiences, was teaching people dance steps like "Do the Funky Chicken." Today, Thomas may be most famous for the 1963 R&B classic "Walking the Dog," which the Rolling Stones later covered. Even more significantly, he and his daughter Carla first brought the Stax label to prominence with their 1959 duet "Cause I Love You," which became the Memphis soul label's first big hit. While he had been recording since the 1940s, he reached his peak in the late 1960s, winning over newer, younger fans with his humor, powerful voice, and good-time sound. Concord Music's Stax reissues recently released a remastered version of his 1969 comeback album Do the Funky Chicken, and it reminds listeners of an artist who did not take himself seriously, and just wanted fans to dance. While the title track and an uproariously funny cover of "Old McDonald Had A Farm" remain highlights, the irresistibly funky "Rufus Rastus Johnson Brown" contains the one-two punch of Thomas' raspy voice backed by his son, Marvell Thomas, and members of the Bar-Kays. Whatcha gonna do when the rent come around? Anyone who has dismissed Brown as a footnote in R&B history, recording essentially novelty songs, should hear this track. While short at two minutes and forty-two seconds, it still inspires joy and some serious dancing. "Rufus Rastus Johnson Brown" shows that great R&B is ageless—remember, Thomas was 51 when he laid down vocals for the song. In addition, it contains the best qualities of soul music: genuine emotion and superior musicianship. Slap this track on at your next party, and watch the crowd come alive.